Badia Prataglia to Abbey La Verna – a day of superlatives. View from Frassinetta, at the end of valley my path was to take me through. The dramatic rock formation, which is home to the monastery of La Verna, obscured by cloud, but regularly visible. Dense vegetation and dramatic mountain formations characterise the national park for as far as the eye can see (which wasn’t very far today, due to constant low cloud cover and rain. La Verna now obscured by the hill in the foreground, which was the first hurdle to be navigated after traversing the floor of the valley. The village of Rimbocchi, approached from the NE after an ankle-breaking descent into the valley. The elevation profile of today’s stage…over 1.250 me in all! A particularly beautiful climbing rose in Rimbocchi, reminded me of a New Dawn that grew against our home in Pöcking. Rimbocchi from the S this time, at the beginning of a long and strenuous pull up the first hill of the afternoon. Backbreaking uphill trail for the best part of 5km without relief. The La Verna Rock within touching distance. La Verna getting closer by degrees, each new vista spurring me on to reach my destination for the day. View back down the valley to the W.
Last leg up to the monastery – very excited to see what will be at the end of this walk. Stunning scenery with ancient moss-covered stones and gleaming beech trees with an increasingly muddy trail leading between them. I have coined a new photo type: the squelchy. Here, about 30 minutes from the summit, my first squelchy and a taste of the sort of terrain I had had to and still had to navigate. Massive rocks scattered like so many green cushions around the hillside. Scenes from the sacred forest on the approach to La Verna. The path narrows and steepens…almost there. Suddenly the monastery rises out of the living rock, looking as if it had been hewn out of the cliff itself. Made it! The long steep path to the gates of the monastery and the last long climb of the day. A sight that has soothed the souls of thousands of pilgrims over the centuries. The cross dominating the courtyard within the Refugio – with a blue sky before the onset of the next thunderstorm. A short, strenuous and deeply enjoyable walk today from the minuscule village of Camoldoldi over the hill to the romantic hillside village of Badia Prataglia. My guide informed me that today’s section was only 8km with approx. 500 em., all of those meters to be confronted in the first three kilometres. Thereafter a fairly flat walk across the top of the mountain and then an approx. 450m drop to Badia Prataglia on the other side. The suggested time for the walk was some four hours, but even with an extra 10kgs of weight I wasn’t sure how it would be possible to execute such a short distance in more that 2,5 hours. Knowing that it was going to be a short – whether 2 or 4 hours remained to be seen – walk, I decided on a leisurely start and a long breakfast in the delightful bar of the I Tre Baroni, who couldn’t have been more helpful or friendly if they tried. Nothing was too much trouble for my host and, surrounded by the products from the next door monastery’s artisan workshop, La Vecchia Farmacia, such as honey and chocolate and jams and candles and cakes and even home made ice-cream, I luxuriated in having time for an unrushed breakfast before setting off into the bright sunshine for my jaunt over the hill. The walk was lovely – the forest comes right down to the edge of the village and just after crossing the ancient stone bridge at the entrance, a stony path emerges that appears to rise vertically up into a dark mass of pine trees. This would have been very challenging if my breakfast had been a “Full Irish”, but Italians don’t do breakfast (well, not what we would recognise as breakfast), and my tea and small panino were not much of a drag on performance over those first few hundred yards. Scenes from the walk from Camoldoldi to Badia Prataglia, a short hike with a steep ascent of approx. 500em in 4 kms before dropping down again into Badia Prataglia. The trail climbed steeply and relentlessly over the next four kilometers with hardly any respite, as it snaked through the dense, shadowy pine forest. A sign told me that the forest was called sacra foresta or sacred forest although it felt more like a foresta timorifica. The ascent ended abruptly at 1.200 m and the levelling out was accompanied by an immediate change of vegetation. Up through the foresta sacra, a long steep pull up to 1.200 em, through a dedicated pine forest on this northern side. On the north side of the hill that I had just marched up, the forest was, as mentioned, entirely coniferous, consisting exclusively of monstrous gangly pines, their bare stems rising up like so many mikado sticks into the light a huge distance above, their bushy tops blocking out almost all the sunlight. From the flattish top of the mountain, all the way to the village on the south side, the wood was exclusively beech and deciduous, which made for a dramatically different light and texture. Gone was the dank, dark foreboding of the previous ascent, to be replaced by a vivid lime green explosion of light, filtering the late morning sun (it was now 11 o’clock, having started at 10 on the dot) and suffusing the trail with a rays of sunshine. Also from having no views other than the endless rise of wood and mountain flank on the north side, this southerly aspect of the walk gave me regularly teasing glimpses through small breaks in the trees, of the hills rolling out in front of me and presumably a taste of what I could expect on tomorrow’s long haul to the mountain abbey of La Verna. The view across to La Verna tomorrow’s challenging stage to the ancient abbey. Given that I was making such good progress – this whole section was going to be put to bed in under 2 hours at the pace I was clipping – I chose a shaded spot on an outcrop with a breathtaking view to break open my thermos of tea, prepare a fresh focaccia with the remains of my tomato, pecorino and parma and some of the monk’s chocolate that I had bought from the bar earlier that morning. These moments – as I have written before on so many occasions – are what this walking lark is all about: alone, body alive from a few hours morning walking, between a safe harbour left in the morning on the way to who knows what, immersed in endless countryside, accompanied only by birdsong and the thoughts in my head, and a cup of hot tea in my hand, gaze drifting out over a distant horizon or back over the path just taken; moments of deep peace and gratitude: for the ability to make time for such a journey, for the constitution that allows me to attempt it, for the ability to savour and enjoy every minute, for the gifts to each of the senses, in sum, for the sheer pleasure of being alive on a beautiful planet and being lucky enough to enjoy it. The drop down to Badia Prataglia was an easy walk and done in under 45 minutes. I spent a good half an hour sitting on a bench overlooking the village and trying to calculate my likely route for the next day, figuring that it was far too early to turn up at my lodgings at the Albergo Foresta. Badia Prataglia, a gem of a village nestled in the crook of the valley in the midday sun. When I did appear there at about 1230, the landlord and his wife were busy with redecorating two rooms and the house was full of workmen and smelled of concrete dust, for which they apologised and sent me packing off to the village for lunch. I won’t bore you with the details of what became a soporific and lazy day, resting my muscles, which are now changing after four days on the road, or of the delicious dishes of porcini with just about everything (pasta, tagliata, polenta) that I consumed – the warm weather and the recent rain have created almost ideal conditions for porcini and the menus – the heavens be praised – are groaning with them. Suffice it to say that today felt like a day off and gave me the opportunity to take stock of the trail so far, to rest, wash my kit and prepare for tomorrow’s 8 hour, 1.000 em trek to the fabled Abbey of La Verna at the edge of the tuscan national park. The forecast is for rain and possibly a thunderstorm. After yesterday’s travails, it had become imperative to divest myself of some of the surplus weight and unnecessary kit, that had made the previous first two days such heavy and painful going. So, as I wrote yesterday, my first task of the day was to lay out all my equipment, clothing and electronics and sort them into appropriate piles. Then having made the selection – the ‘no’ pile being embarassingly large – the hunt began for a suitable scatola or box, which I could make up into a pacchia di poste and then dispatch back off to Ireland, before resuming my trail. My landlady was mildly helpful, although I suspect it was her workhorse daughter-in-law who actually went out and rummaged for a box that seemed fit for purpose and soon my package was packed and only required taping up and sending on its way. For anyone reading this, who is keen to experience a sense of timelessness, of a universal space in which time has no meaning, I can highly recommend a visit to an italian country post office with a task a little more complex that sending a letter. The process of weighing, addressing, preparing, choosing the best form of dispatch, of registering and of paying was the work of at least an hour and evidently such an exciting task that it required the full attention of both (charming) women in the post office over a period that, given their meagre opening hours, consumed the best part of their working day and was evidently so challenging, that they had to send out for a supply of cappuccino to the local bar about half way through. Our greatest challenge came about 30 minutes into play, after the coffee had arrived and we were ready to enter the details of my registered express parcel into the computer system. The concept of a non-italian wanting to send a parcel abroad seems not to have occurred to the architects of this system. Or at least, that a person not in possession of an italian ‘codice fiscale’, which I quickly learned is an italian tax ID number, would ever want to send a registered parcel abroad, was deemed to be out of the question. My suggestion that we just make one up, was greeted with interest and a certain admiration, but elicited the wry comment from one of the ladies on Team Pacchia Irlanda, that the system would know and that we would have to find another way. Several telephone calls – presumably to superiors in Rome – later and 20 minutes in which both ladies were inexplicably hacking my personal details into an app on their iphone, they cracked the enigma and generated a codice fiscale for me, or at least for my parcel, at which point they awarded themselves a round of applause and were joined by the two elderly customers in the queue behind me, for whom, self-evidently, this was the most exciting event of the yet young week. The best part of the process was when Teresa (my primary carer) asked me to choose between two options, in case the parcel should prove to be undeliverable. Option one was ‘return the parcel to you at your own expense’ and Option 2 was ‘Destroy the parcel’. I chose Option one, of course, knowing that the only way of ‘returning’ the parcel to me was by delivering it the address that had previously proven undeliverable. The irony of this Catch 22 was entirely lost on Teresa, who, with the aid of a few judiciously placed arrows drawn in biro on the form, connected option one with my irish address, to make absolutely sure that even the most stupido postal employee, knew what was expected of him. I wonder whether I will ever see my parcel again? 5,25kg was the weight of the package when it finally left my hands, of which no more than 150gs was accounted for by the box itself. So that was 5,1kgs of stuff I could and ahould have left at home (idiot) and – more importantly – 5,1 kgs that I would not have to be schlepping over hill and dale for the next three weeks. And so at 1000, on a perfect morning, having treated myself to a celebratory pannino and a tea, I shouldered my now featherweight pack and set off for the hills. My day’s walk was a long uphill pull over the top of the mountain directly behind Stia to the Eremo Camoldoldi, the first of the fransiscan Abbeys on the trail, and then on to the village of Camoldoldi below. 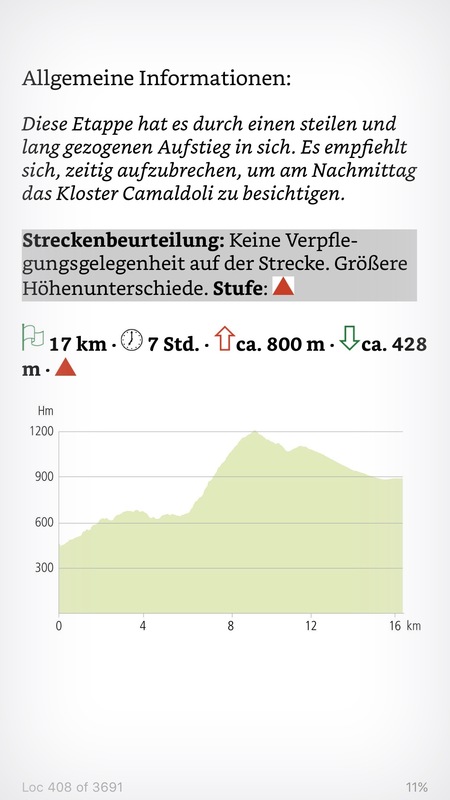 The stage profile showed an unrelenting climb from around 400 em to 1200 em befor dropping back somewhat on the descent to the village from the Eremo. Relieved of my extra weight, I almost flew up the hill, my back pains miraculously vanished, and enjoyed a fabulous, near-perfect day’s trail walking through poppy-filled filled fields, oak woods, grassy footpaths lined with needle furze, awash in yellow flower, past ruined miniature castles and huts, over rushing streams, full from the previous weeks rain. My tea break – with crostata from the village bakery, fresh that morning and still warm when I opened it – was taken sitting on a rock in a shady spot above a rushing waterfall, with the sound of a cuckoo calling in the woods below. My garmin told me that this was the last point before the long steep climb up the hill began in earnest. Consequently my next break for lunch – fresh pecorino, parma, a tomato that bore no relation to the perfect rounded engineered dutch variety usually available at home, and a focaccia – was taken at the 1.000 em mark, at the last open space before the trail disappeared back in to the woods, affording me sensational and awe-inspiring views of the valley, into which I had emerged only yesterday with the town of Stia nestled below at the western most end directly below me. And then on and up to the Sacro Eremo, finally warming my face in the sun, whilst sitting on a log bench in front of the Abbey and drinking a fresh tea from the little espresso bar, which no italian institution, be it never so small, is allowed operate without. A charming hotel, I Tre Baroni, with an excellent little bar, providing me with the best ice-cream on the trail so far, provided my stopping point for the day and given the speed with which I had executed the walk today, afforded me an easy late afternoon in which to dry and clean my kit, catch up with some reading and not have to worry too much about the rest of the world as the only thing Camoldoldi does not have is mobile reception or a Wifi connection that works reliably.